Pele was born on 23rd October, 1940 in Mans Gerais, Brazil. 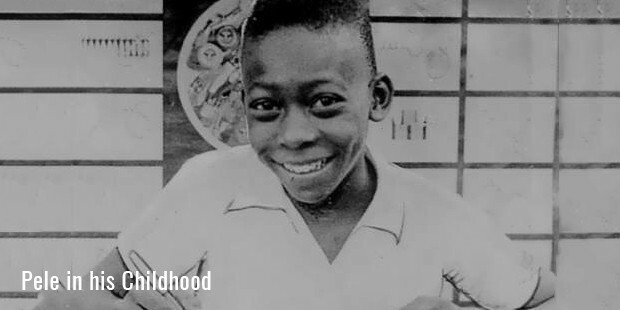 Pele grew up in Bauru, Sao Paulo in utter poverty. He earned extra money by working as a servant in tea shops. He could not afford to buy a proper football so he would play with a sock stuffed with newspaper tied with a string or grapefruit. He was trained by his father by a very young age to be a footballer. His father Dondhino was himself a former footballer and leading scorer for the club teams he played for. 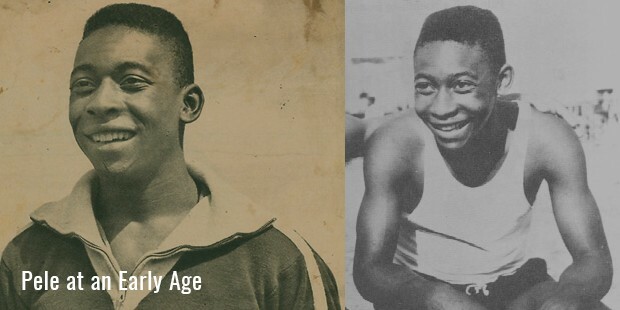 In 1956, Pele joined professional club Santos FC. He was just 15 year old at that time. On 7 September 1956 he scored the first of his 1281 goals against Corinthians Santo Andre. In the year 1957, Pele became the top scorer in the league. He was soon under the spotlight and was called up to the Brazil national team. 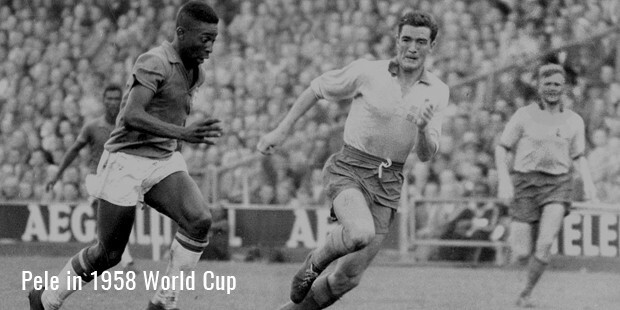 Pele played in 1958 World Cup as a 17 year old. Major clubs like Juventus, Real Madrid and Manchester United were trying hard to sign this young sensation. 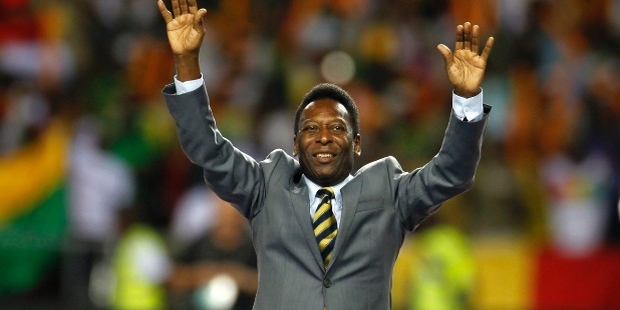 But due to the interference of the government, Pele stayed in his own country. 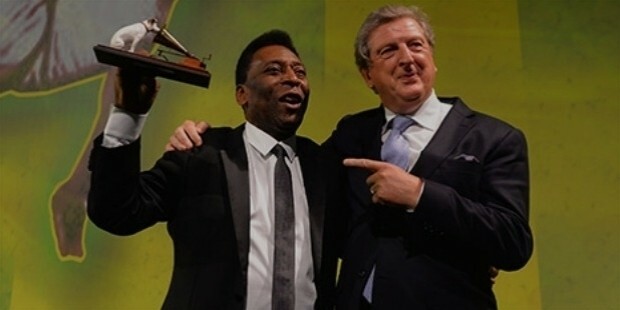 Pele led Santos to win the Campeonato Paulista by being the leading scorer with 58 goals. 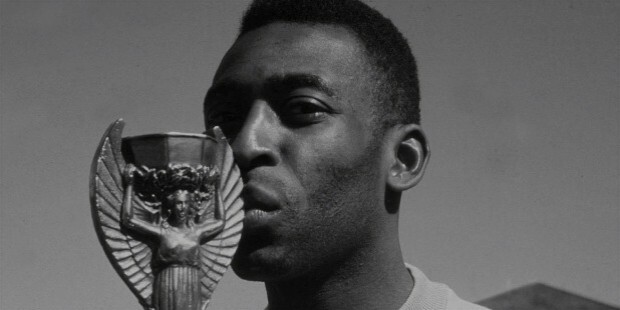 Again in 1960, Pele scored 33 goals to inspire his team to regain the trophy. He also helped them qualify for the Copa Libertadores which was the most prestigious tournament in the Western hemisphere. He led his team Santos in breaking many barriers and taking them to many prestigious trophy triumphs. His electrifying play and hunger for spectacular goals made him a celebrated sportsman throughout the world. Pele along with Santos toured the World to play exhibition matches in different countries making it a huge attraction for the spectators. After 19 seasons with Santos, in 1974 he retired from Brazilian football. In 1976, Pele came out of semi-retirement to play for the New York cosmos. 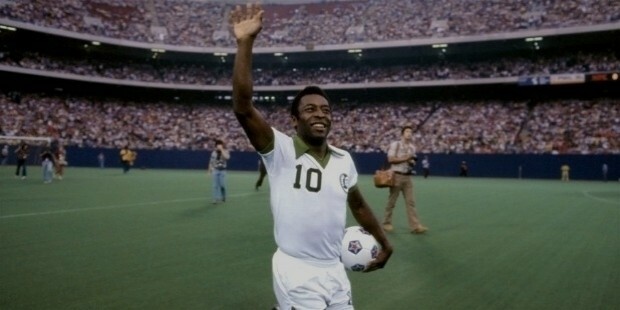 Pele presence in the U.S. helped create a huge following for soccer in the country. 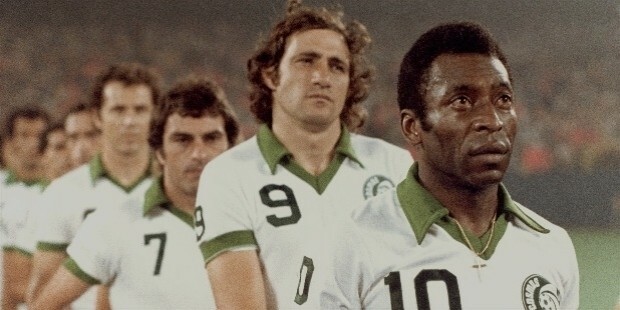 Though Pele was 36 years old by now, he led Cosmos to win the NASL championship in his third and final season at the club. His last match was an exhibition match between Santos and Cosmos. He played the first half for Cosmos and the second half for Santos. Pele’s international career was a glorious one. He became the youngest player to score an international goal when he scored against Argentina on 7 July 1957 at the age 16 years and 9 months. 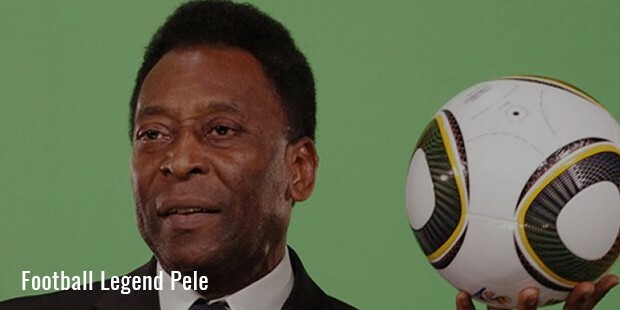 In 1958, he became the youngest player to score a goal at the World Cup. He scored six goals in four matches including two goals in the final to help Brazil win the World Cup. 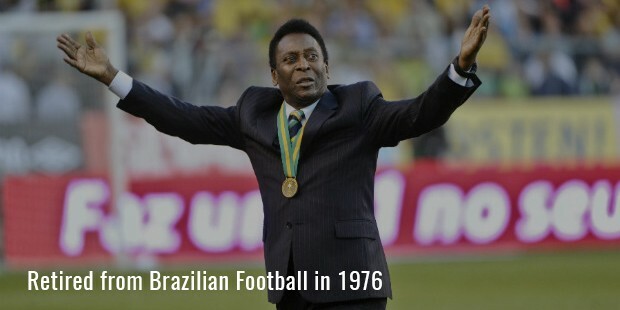 In 1962, he was part of the Brazil team but was injured in the first match of the tournament. Brazil went on to win the World Cup without him. In the 1966 World Cup, inspite of boasting of the best stars in World football at that time, Brazil was knocked out in the first round itself which was a disappointment for the football fraternity as a whole. But Pele and and a new looking team dominated the 1970 World Cup with Pele being named the Player of the Tournament. Pele reached the zenith in the football world by just performing day in and day out for the respective teams that he played for. 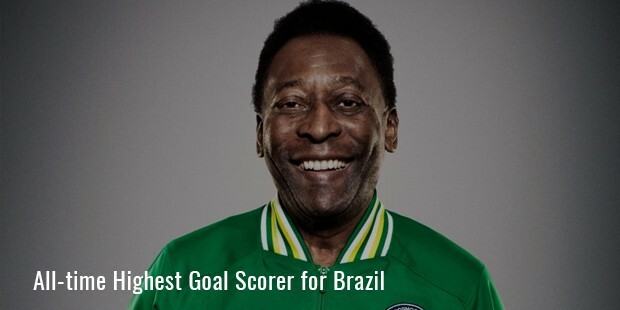 He is the all-time highest goal scorer for brazil scoring 77 goals in 92 appearances. He has also been part of three World cup winning squads. He has scored a total of 1281 goals in 1363 matches which is highest number of career goals scored in football. 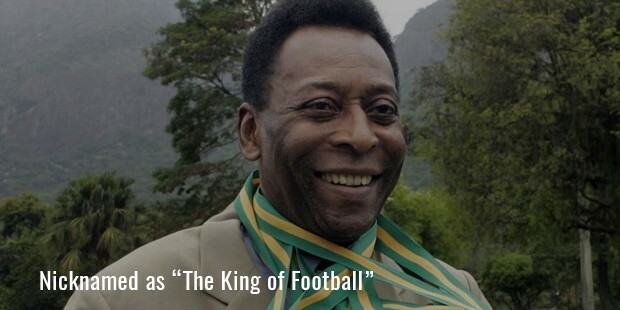 He has been nicknamed ‘The King of Football’, ‘The Black Pearl’ and the ‘The King Pele’ by his fans. He has been regarded as the greatest footballer of all times by many football critics, former players, football fans and experts. In 1999, he was elected the ‘Athlete of the Century’ by the International Olympic Association. He is widely respected for his participation for environmental and social causes. He has not only been one of the greatest athletes’ ever seen but also one of the most down to earth human beings. From playing with newspaper scraps to becoming the poster boy of World football is an amazing journey indeed.